This heavily carved musical wall trumpeter clock was made by Emilian Wehrle C1880. It was located in the United States last year (2008), and a deal was struck this summer to bring it out West :) The clock is large over 44" in height. The carving is done extremely well. 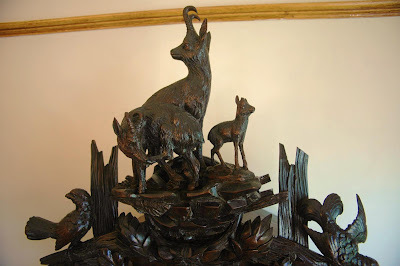 The clock has 7 full relief live animals, the most we have seen on a Wehrle...because of that reason we had to add it to the collection.The case is in mint condition, with no missing carvings. This clock will need a musical restoration, which we will tackle this winter. Check out this clocks and others just like it in our collection. Thanks for your interest. This is a very rare antique (about 130 years old! ), so the price is highly dependent on the market. For a collector of Black Forest clocks, it's a priceless historical artifact. 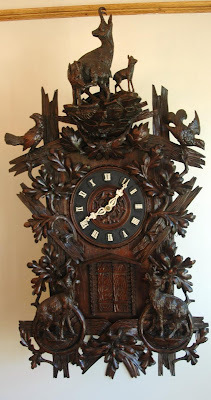 Check out our website at http://www.northcoastimports.com for modern clocks by Black Forest artisans.